I've mentioned several times that I am a huge fan of heavy metal, and heavy metal influences my writing. But what do I mean by this? With the exception of my forthcoming novel INDELIBLE, I never reference heavy metal music directly in my books, nor do I write about musical topics or hardly even mention music. So how exactly does heavy metal influence my writing? To begin with, let's consider what makes heavy metal, well, heavy metal. 1. Metal is loud, bombastic, and aggressive. That's not to say that there aren't subtleties and nuances to be found in the hurricane of power chords, thunderous guitar riffs, light-speed double bass drumming, and ferocious vocals, but one defining characteristic is its sheer massive power. Metal music is not tame or shy or weak. It's not vulnerable or overly-sensitive. Metal music is overt, in-your-face, and above all, empowering. It's not music to make you search your soul for the source of your misery; it's a jackhammer for you to blast your misery into tiny fragments, and then take said jackhammer and destroy every piece of furniture in your living room. I strive to incorporate this brash aggression into my writing. Writing a novel is a more delicate process than bellowing a heavy metal anthem, but it doesn't mean it has to be limp-wristed and timid. My writing is often violent (physically or emotionally) and I intend for it to be a challenge to the reader. Metal isn't easy listening, and I don't want my books to be either. 2. Metal is dark and cynical. Heavy metal won't give you the warm and fuzzies. It's not music to set a romantic mood or soothe your soul at the end of a long hard day (although it can be cathartic when you feel like you want to break someone's head after sitting in traffic for three hours). The lyrics often deal with dark, negative themes, and you won't find comfort or resolution in the crushing chords of a metal song. There have been moments when I've listened to an epic metal opus and I could feel my heart literally wither inside my chest. Metal can be majestic and soaring at times, but even these songs have a hint of menace in them. That's just the nature or metal music - heaviness is essential, and heavy = dark. The same can be said for the subject matter: anger, disillusionment, challenging authority, struggle, and war. Not exactly the stuff of lullabies and love ballads. In my own writing, I don't want the reader to feel comfortable. I incorporate some elements for shock value, but I want the book itself to be a challenging experience. To accomplish this, I include unlikeable characters, disturbing themes, and epic struggles that don't always turn out all right in the end. My books aren't necessarily depressive and bleak, but they won't make you feel like whistling a happy tune as you skip down the street. 3. Metal takes pride in being outside the mainstream. The metal movement is massive, with tens of millions of fans all over the world. Yet is is largely maligned by popular society. This is part of the draw of heavy metal. 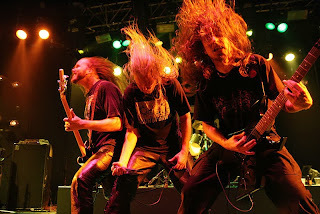 People who feel like they are on the fringes of mainstream society are drawn to metal music for the very reason that it too is stereotyped and dismissed by the masses. In recent years, metal music has become more acceptable in mainstream society but this is only in limited amounts. The majority of metal music is underground because most people simply can't handle it. It will never be "popular" and that's what it wants. Metal music wants to be respected but it doesn't want to be a part of normal society. It wears its counterculture badge with pride. I know the subjects that I write about will also likely never be popular. Of course I would like be a successful author, but I have to be true to my imagination. The stories in my head that are clamoring to be written are not about topics and themes that most people would like to read about, but that doesn't mean I'm going to water down my writing to appeal to the mainstream. I want to be the best writer I can be, and if my writing is truly good enough, it will be recognized regardless of theme and subject matter. But until then, I must content myself to be on the fringes of the mainstream book world. This is the path that I have chosen, and I have to accept any struggle that comes with it. Regardless of whether I become a bestseller or remain in the underground, I will keep on rocking. This is the attitude of true metal music and my attitude when I write. You can either take it for what it is or walk away, but don't expect it to change to suit your delicate sensibilities.